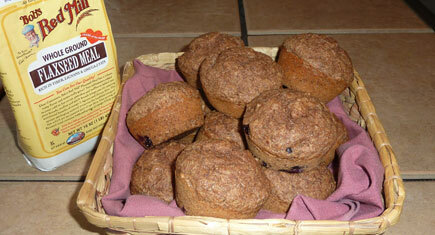 Flaxseed muffins to get things a movin’. It happens innocently enough. Maybe you’ve been skimping on your water intake, or you’ve taken to gulping dinner over the kitchen sink. Perhaps that surprise promotion at work led to a celebratory chocolate-cake binge. Whatever it was your—ahem—southbound lanes have come to a screeching halt. Do yourself a favor and take a pass on the medicine cabinet and use good food as the cure instead. If you read a lot about nutrition, sooner or later you are going to come across the mighty flaxseed. They are being called “the most powerful plant food on the planet” and a must-have for health and wellness. How we have survived this long without adding them to our daily routine, I have no idea. Study upon study shows that a diet rich in flaxseed may help lower your risk of heart disease, increase your memory, thwart off diabetes and reduce your risk of breast cancer. All good things for the future, mind you, but you need help today! You are in luck, as one of the richest sources of both soluble and insoluble fiber, flaxseeds are also a natural laxative. No nasty chalky flavor here, they have a mild nutty taste that lends itself well to baked goods. Just make sure you use ground or milled flaxseeds, also known as flax meal, to get the full nutrition and benefits, as they’re easier for the body to absorb that way. The basic recipe that follows, courtesy of Spiffyman Nutrition, offers a lot of wiggle room. You can use it “as is” or adapt it to your own tastes by adding blueberries, coconut, almonds, raisins, chocolate chips—whatever strikes your fancy. Enjoy them any time, not just when you are in crisis mode, but just be sure not to overindulge. Wash it down with a tall glass of water, and you’ll be back on track, buzzing down the super highway of life in no time.